Here it is. 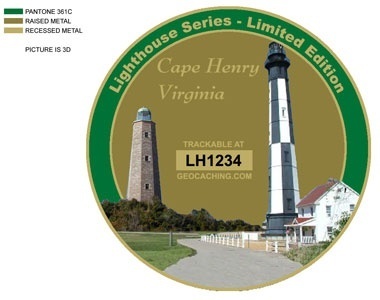 The next in the series of Lighthouse Geocoins. There will be a total of 300 coins minted. 100 Gold, 200 Bronze. They'll be trackable on GC.com and have the Lighthouse icon. Some slight changes this time but they will still be listed on ebay. Once the Gold coins are sold out, I will post a link to the Bronze coins. Once you have made your purchases, you can pay for both coins at one time. This should eliminate over orders. It will also give everyone plenty of time to get the gold without having to worry about rushing to get bronze. Does that make sense? Questions? Comments? Shipping: $1.80 for orders inside US. $4.75 for orders overseas. Shipping discount: $1.80/$4.75 for 1 coin, .50 for each additional coin. We expect shipping to be around 6 - 8 weeks. Here's the rendering. The front will be 3D (not color). The back with be the same as the first Lighthouse coin with the AGA Logo. NOTE: 10 Gold and 20 Bronze coins are spoken for. Purchases will be limited to 2 gold coins and 5 bronze. Can't wait to order these, is there a limit on the number when ordering? Oops, just saw you edited your post. Question answered. Sorry, I always do that. 7:00PM Eastern Time. I hope someone can get me one. I will trade for Cat geocoin LE (Gold or Black Nickel). I'll have to go to sleep..
Front 3d without Color -> US$ 9.50 why is the price that high? Thats kid of late for us non-residents so if anyone wants to order extra am willing to trade 1 LE English coin for LE lighthouse and 1 Reg. English coin for reg lighthouse. English coins will be ready by 1st of Feb. Who wants the golden EGG? There will be a total of 300 coins minted. 100 Gold, 200 Bronze. .
Was the first lighthouse coin this small a minting? I think the first was 100gold and 300bronze. At least that is what I have in my notes. I have the same question is to where the link will be. And are the auctions going up at the same time? I read the above with posting the links at different times but want to know for "searching" purposes since alot of people will doing that. We will be watching for these!! Are you going to limit the amount people can buy? He said the gold was 2 per person. Didn't see a limit on the brass tho. Purchases will be limited to 2 gold coins and 5 bronze. I was looking above the picture. I ordered my Lighthouse series 1 in November. Have yet to see them. Has anyone else got theirs? Is this a social experiment to see how many coins in a series can be presold before any are delivered? In another post somewhere, jmbella said the 1st series was due to be received right after the LIGO coins. Since he received the LIGO coins today, I would think the lighthouse coins will show up next week while he's away. Thanks, AG. You're right. I'm expecting them within the next couple of weeks. It's 6 - 8 weeks from pre-order to delivery. I don't think this is much different from any other pre-orders out there. Of course, if you would rather I wait until the first set is delivered before offing these I can do that. The link will be posted here in this thread. The first mint was 100 gold, 300 bronze. 1000 number at a time need to be purchased, so.. 400 for the first set, 300 for the second, 300 for the third. BTW, it was Dec. 2, not November. if anyone wants to order extra am willing to trade 1 LE English coin for LE lighthouse and 1 Reg. English coin for reg lighthouse. I'm very surprised none of you guys have picked up on this. An announcement was made yesterday on the UK forums - you guys are slacking! You mean there are geocaching forums outside of the geocoin discussion forum? Once the Gold have sold out, it will be a few minutes for me to get the bronze up. Keep checking this thread for the link. FALSE START. You are penalized 3 minutes. LOL! No golds for you! Some poor innocent site just got instantly crushed with hits. That's not funny at all....you should be banned from the forums! will it be here at the end or in an edit at the top?? 3 coins, with a limit of 5 bronze that means you still get 2. I think he should hide it and make it a real adventure. I missed the joke, it went right over my head!